to contact the company during this period as other email addresses might not work. December 2014 -Since 1978 readers have been asking for copies of the book which had been out of print. In 2006 the book was reprinted. Now we can announce that the 2006 reprint is sold out as well as its 2008 successor. and can be ordered via the internet!! THIS is a re-issue, up-dated and much more fully illustrated, of the book first published in 1944 that released the hitherto top secret story of what is surely the most dramatic and inspiring shipwreck and rescue drama of all time. The story is true in every particular, incredulous as many a reader is likely to find the amazing series of events related. There were some who labelled it "the wildest fiction" when first they read it. But it has stood the test of time. The incident that led to the participation in the drama of the Merchant Marines of several countries, the British and South African Navies, the South African Air Force, the South African Army, the South African Police and the South African Railways and Harbours Administration,demanding from each of the men their utmost resources of courage, endurance, persistence, ingenuity, compassion and humanity, as well as intelligence and muscle, took place midway through World War 2 off the coast of South West Africa that is scheduled soon to become the independent country of Namibia. That particular part of the S.W.A./Namibia coast has been for centuries for all who knew it the most frightening piece of the Earth. The story of the wrecking of the big British passenger liner Dunedin Star and the eventual rescue of her more than 100 passengers and crew, at the cost of other lives, another ship, a big aircraft, a number of army trucks, etc., has become known to millions since the book was first published, and is generally accepted to be the peer of true adventure stories so far to come out of Africa. Edition after edition of the original book came from the presses in English and in translations in Africa, England, the Continent of Europe and America, over a period of nearly a quarter of a century. However, the last edition was sold out more than a decade ago, so this up-dated and expanded and generously illustrated re-issue is certain to be eagerly received. 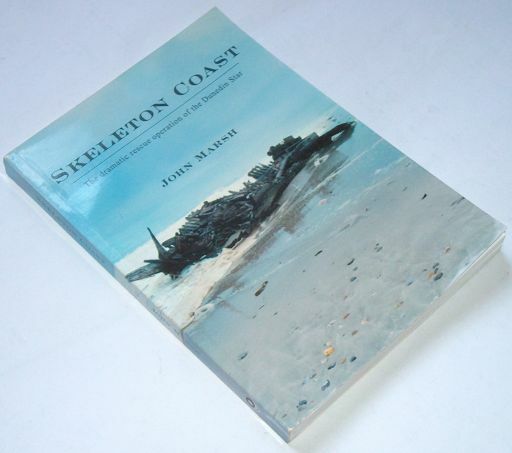 Naval and military censorship ruled when the earlier editions of Skeleton Coast were published, and only a handfull of approved photos were obtainable to illustrate the book. But for this expanded re-issue a remarkable collection of nearly 100 pictures, many of them history-making and of dramatic action, and most of them now published for the first time, has been assembled. This internet version and the 2014 reprint is based on the last edition to be published by John H Marsh in November 1978 in which he added details about the fate of each participant as an Appendix to the end of the original book. There are a number of different formats of this book available to you depending on where you are in the world. The printed 2014 edition (hardcopy) is available from the publishers (Namibian Scientific Society - Namibia) or from Mike Marsh in South Africa. It can be bought and posted (registered mail) to readers all over the world and paid for by Paypal or Credit card.